DDS continued working on hacking the ROM conversation code as well as figuring out its structure, he’s been able to modify the dialog options, yay! He’s posted his advancements as an IPS file at http://www.mediafire.com/download/88s2nb22oav033z/ultima.zip; it should be of interest only for dev, as only a tiny fraction of content is translated. However, with a new batch of info from him and after a lot of further ROM digging, I made further advancement on the script extractor (ROM disassembler?) we get closer and closer! -- ENGRISH: Welcome back, Avatar. 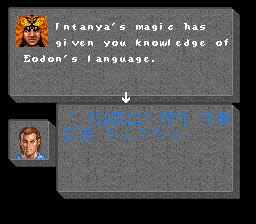 -- ENGRISH: Magic of the inter-Nha is, given the power to speak the word of you to Iodon of the valley. -- ENGRISH: Avatar. You are he a long time, it had been affected by the heat. But, the other, I became completely well. -- ENGRISH: To you, to try to do this totem. While in the valley, and are not let go any way. -- ENGRISH: Disciples of the inter-Nha is, to discover you have fallen owed a large scratch, was brought here. -- ENGRISH: Inter Nha, it cures you of scratches. But it had been a while been affected by the heat, saying delirium. It is a dream of the story. -- ENGRISH: You are in a dream, was calling Aiera and Lufkin and Jimmy's name. First of all, you can find them. -- ENGRISH: that you has me back brought Aiera, chief was grateful Do really pleased. -- ENGRISH: Warriors of this village, looking for a Aiera in full force. Aiera's the daughter of the chief. -- ENGRISH: It was kidnapped Aiera It 's Urari group. -- ENGRISH: To the east of this village, in the village of Yoraru group, and there are such name who, I have entered into the ears of the inter-Nha. -- ENGRISH: Lufkin, and to look for the other fellow, and so become a force, spirits say. -- ENGRISH: I saw Inter Nha, a strange dream. Dream, Lufkin has taught me to know the whereabouts of Jimmy. -- ENGRISH: It is a tribe who live in very far away. It is west of the stone city Nauatora. -- ENGRISH: Nauatora family, is the capital of their stone, is called Thich Thi Quatre. -- ENGRISH: To the west of Nauatora, there is a village of Disukiki. -- ENGRISH: It is a warrior tribe that fearless. And go to the east from the village along the road. -- ENGRISH: Road leads to the village of Yoraru. The south, but Nauatora. -- ENGRISH: Urari family lives in Kakurezato. Spirits also, do not you tell me the location. -- ENGRISH: But, Spirit was promised. Ingredients or not always, we-out of the village of Urari! Figure, Issuing only click the Aiera. -- ENGRISH: If longer Nigake the Aiera and except for the story to take to the A pain pain down chief. -- ENGRISH: If you are etc. husband ... mood Rattle or length India in this totem friend, can you Hoke the power of attractive magic to you. -- ENGRISH: When Yo told the husband etc. friend, can you in front of Mamoru of pressure to you. -- ENGRISH: This addition to the totem, it looks at the power of. -- ENGRISH: From the time Mareta, it has been much called inter Nha. -- ENGRISH: We have a party of family Kuraku. Except for the words of the spirit, to heal wounds have a person or a person who is affected by heat. -- ENGRISH: In addition, the cure anything, there is a large force. Fortunately, you in the, and there is no cormorant its power. -- ENGRISH: If, when there are only bitter inter Nha, the stomach totem've done to you, you come back to the nest. -- ENGRISH: Spirit's was good. It is already large. -- ENGRISH: Inter Nha is, there are Modachi to tribes. Do such, I me lot to Inter Nha. -- ENGRISH: Here is the village of Kuraku group. Chief nitrous pain pain down. If you have not taken yet, and Oke was Aisarai. -- ENGRISH: Gonna have Tsu that the spirits, Abataru. DDS pointed an issue with the charset being offset from a given character thus generating garbled japanese for the latter part of the dialog. Still looking for that issue. Going thru all the dialogs and figuring out the values for the flags that control the conversation’s flow. Further work on the script extractor, thanks again to Vehek for his tips to transform font table indexes into ShiftJIS characters. 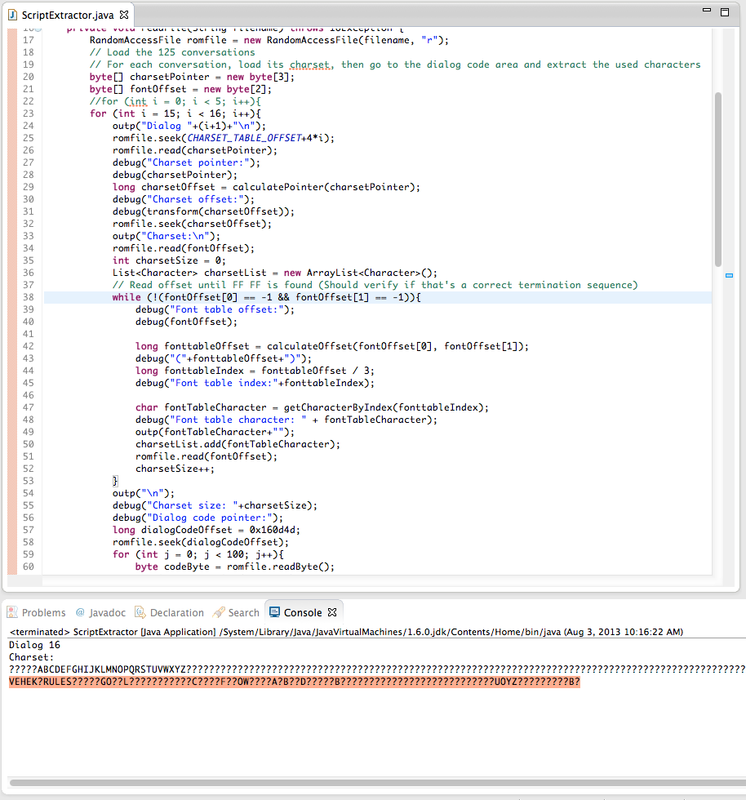 Found out the conversation options are inside the same piece of code that the dialog text, which is nice. 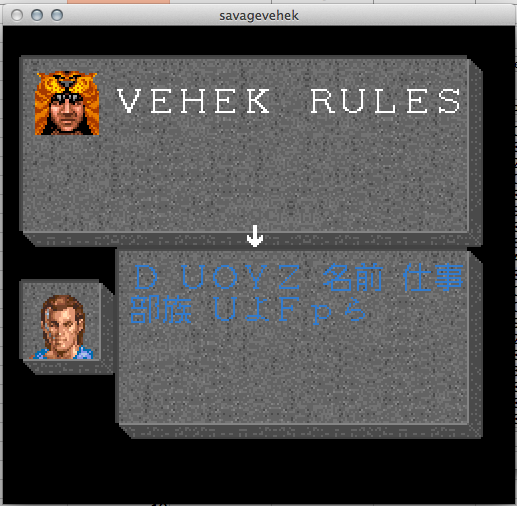 As noted already, japanese character are in Shift-JIS order in their respective groups in the tileset. HOWEVER, this is not completely true in the font table, specially for kanji which seems to be grouped on groups of 93 or 188 kanji. Another issue to make a Shift-JIS mapping apart from the gaps, is the fact that the mapping seems to have two blank spaces between kanji “groups” (http://www.rikai.com/library/kanjitables/kanji_codes.sjis.shtml ). 0x120000 – Font Sprites in 2bpp mode, roman, hiragana, katakana and kanji, with symbols mixed in-between.